The city of Orange is located in Orange County, California. Orange is unique in that many of the homes in its Old Town District were built prior to 1920. While many other cities in the region demolished such houses in the 1960s, Orange decided to preserve them. On November 1, 1776, Mission San Juan Capistrano became the area’s first permanent European settlement in Alta California, New Spain. In 1801, the Spanish Empire granted 62,500 acres to José Antonio Yorba, which he named Rancho San Antonio. Yorba’s great rancho included the lands where the cities of Olive, Orange, Villa Park, Santa Ana, Tustin, Costa Mesa and Newport Beach stand today. Smaller ranchos evolved from this large rancho, including the Rancho Santiago de Santa Ana. Since at least 1864, Los Angeles attorneys Alfred Chapman and Andrew Glassell together and separately, held about 5,400 acres along both sides of the Santiago Creek. Water was the key factor for the location of their townsite. The town experienced its first growth spurt during the last decade of the 19th century, thanks to ever-increasing demands for California-grown citrus fruits, a period some refer to as the “Orange Era.” Southern California’s real estate “boom” of 1886-1888, fueled by railroad rate wars, also contributed to a marked increase in population. Like most cities in Orange County, agriculture formed the backbone of the local economy, and growth thereafter was slow and steady until the 1950s, when a second real estate boom spurred development. Inspired by the development of a region-wide freeway system which connected Los Angeles’ urban center with outlying areas like Orange, large tracts of housing were developed from the 1950s to the early 1970s. 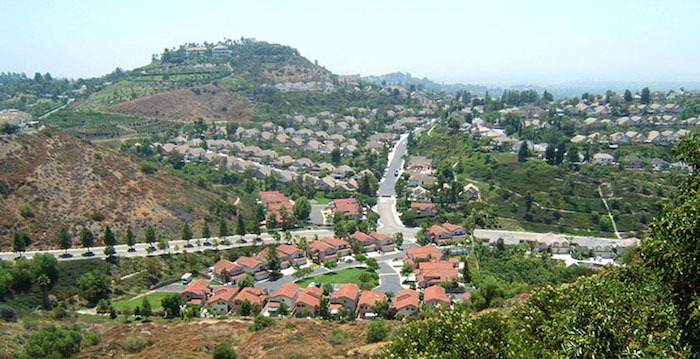 The population of Orange, CA was 136,891 as of 2014.